Eat Your City: Banana, pineapple, craisin, chocolate chip, apple and flax muffins or banana bread loaf - low fat, high fibre and delish recipe! Banana, pineapple, craisin, chocolate chip, apple and flax muffins or banana bread loaf - low fat, high fibre and delish recipe! I revamped a banana pineapple muffin recipe I had kicking around for years to give it a bit more flavour, fibre and moistness boost… it definitely passed the kids, pregnant ladies and friends test, so sharing it with the world :) With most muffin recipes, you can replace out a lot of the oil/butter with apple sauce or pureed fresh apples.. so I did that, added in a bunch of ground flax for fibre, a punch of omega-3's and a nice nuttiness flavour, and tossed in some craisins for a bit of tartness and sweet - and dried fruit add in lots of fibre too! All the extra fruit give these muffins not only a lot of yumminess - makes them nice and moist for days! 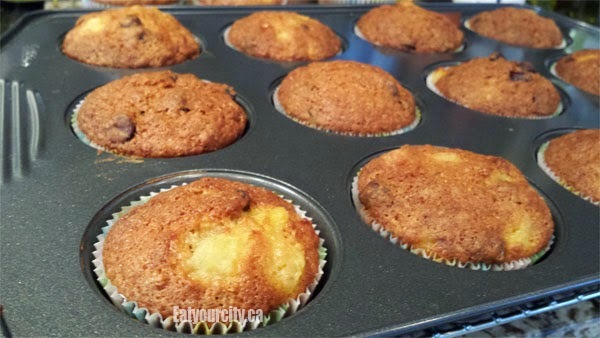 So here be the recipe below… if you can hunt down some of the extra sweet pineapple, yah, as it gives it a nicer sweeter more mellow taste of pineapple in these muffins, and can cut out some of the white sugar in the recipe too. I don't love apple sauce, so I just wash, core and puree an entire apple (skin on for extra fibre) with my super handy cuisinart mini food processor attachment. While you can spray your pans and not use liners, I always use liners as I don't have to spray my Wilton non-stick muffin pans, and sure beats trying to scrape/curse/tease the muffins out if they get baked literally into the pans. You can use whole flax seeds - I use ground flax (stored in my freezer to it dones't go rancid as quickly), as I find you can add in a lot more and it almost disappears sneakily into muffins heehee! I modified this from a recipe that makes 2 loaves of banana bread, so it makes 30 muffins - weird number I know. 1) Pop muffin/cupcake paper liners into muffin tins or line 2 loaf pans with parchment paper. Preheat oven to 350F. 3) In a large mixing bowl, whisk together the eggs, oil/butter, apple, pineapple, bananas and vanilla until combined. Stir in the dry ingredients until there are no more streaks of white seen. 5) Bake muffins for 30min or until a wooden toothpick comes out clean. Bake loaves for 60-70 min until a wooden toothpick comes out clean. Take out of oven, let rest in pans for 10 min, then pop out onto cooling racks to cool. Enjoy!